Police officers have enough to worry about. Between chasing bad guys, trying not to die in a car wreck and the hostility directed towards cops it’s not an easy gig. But things like a mayor making what seem like terroristic threats make a hard job seem impossible. 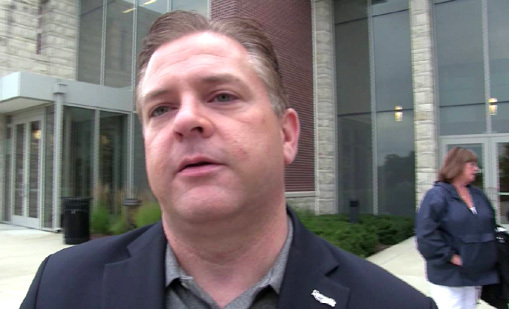 According to the Chicago Tribune, “As the mayor of Romeoville was being booked on suspicion of driving under the influence, he told the local police chief, “I’m coming for you,” and told two other officers, “You’re done,” according to a police report. “Due to (Mayor John) Noak’s tone of voice and his body language I took his statement to me as hostile and threatening,” one officer wrote in the report. One officer wrote that Noak spoke with police Chief Mark Turvey three times while the mayor was being booked. During the second conversation, which took place in a holding cell, “Noak appeared to be upset/crying and Chief Turvey calmed him down,” one of the officers wrote. 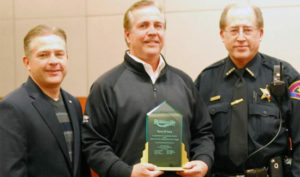 Above: Mayor John Noak, far left, and police Chief Mark Turvey, right, present Terry D’Arcy with a plaque in recognition of the donation of a new D.A.R.E. car for the agency. Credit: Village of Romeoville. You’d think the mayor would be the one worried about this all shakes out. But as any seasoned law enforcement professional understands, that depends on the nature of the relationship between the chief and the person that got arrested. The oficers that wrote the report “expressed our concerns with Noak’s statements to Chief Turvey. Chief Turvey allegedly told them he did not feel that Noak’s threats were any cause for concern.